Why you want to be a REALTOR NOW! Why is NOW the right time to become a REALTOR? The Housing Industry is well past the bubble and there is a pent up desire to own a home. Millions of people suffered through the downturn and are ready to make a change. Equally important is the fact that the population is changing. As the Generation X & Y age their desire to own a home becomes very important to their social status and their feeling of success. Although Millions of people have lost their homes, we will see these people moving back towards Home Ownership. Depending on their situation we may see large numbers entering the buying side within the next 3-5 years. What we find to be very exciting is the Generations X & Y along with the Millennial Generation. 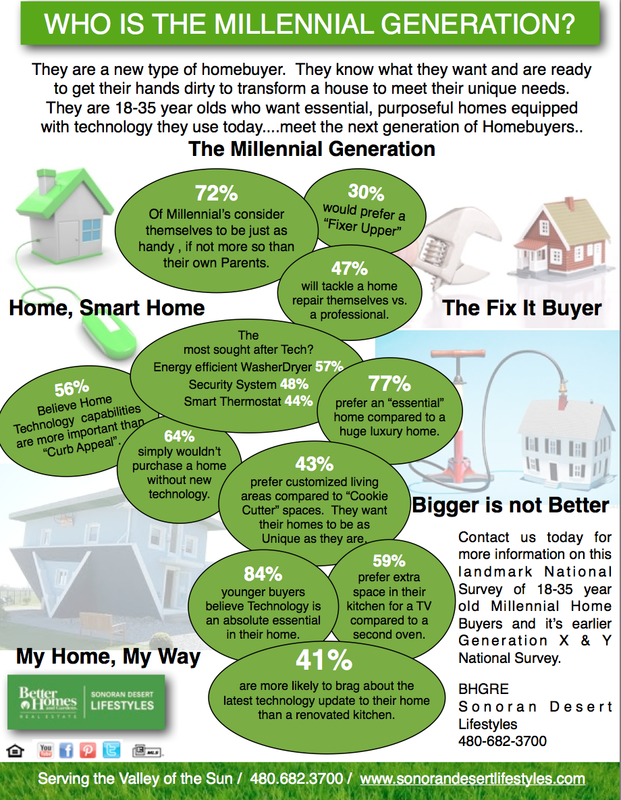 These Generations of future Home Buyers will make a significant impact into the Housing Industry in the coming years. These Generations are very well informed, they understand how to find information and navigate the online business of Real Estate. They are assertive and aggressive to achieve their goals. In fact 75% of Generation X & Y individuals believe that Home Ownership is an indicator of their Success. A Recent Better Homes and Gardens Real Estate national survey found amazing information about these future homebuyers. This information is critical to your success as a REALTOR. Before helping your client, you must know who your client is. At Better Homes and Gardens Real Estate Sonoran Desert Lifestyles we know who our Clients are, and how our future Clients are, we can help you to learn the best practices to communicate with and reach tomorrow’s homebuyers. Did you know that the Gen. X & Y individuals will sacrifice to own a home?